This year, FenwayNation is inaugurating two new awards—which will be given out whenever the Red Sox make the post-season. The awards are: The FenwayNation Post-Season Pitcher Of The Year and The FenwayNation Post-Season Position Player Of The Year. On the position player side, we have named Steve Pearce as our 2018 Post-Season Position Player of The Year. Keep in mind that the awards are for the entire post-season, not just the World Series. Yet, despite Pearce's other-worldly performance in The Fall Classic, his overall post-season numbers were pretty spectacular. In his 13 post-season games, Pearce hit .289—with four home runs (leading the team) and eleven RBIs. His OPS in October was also a team-leading 1.083. In fact, he was the only member of the Red Sox to deliver a post-season OPS over 1.0. While J.D.Martinez hit for a better overall average, and drove in three more runs than Pearce, the first-baseman had a higher on-base percentage and a higher slugging percentage than Martinez. 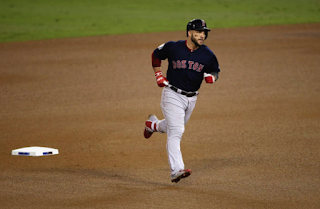 While several players (in addition to Martinez) made extraordinary contributions in individual post-season series (Jackie Bradley, Jr., Brock Holt, Mitch Moreland, Andrew Benintendi), Pearce was the most consistent position player across all post-season games. Thus, we pass on our congratulations to Steve for being named our FenwayNation Post-Season Position Player Of The Year For 2018.